(Newser) – A bunch of tiny worms may have just solved a problem that's plagued scientists and environmentalists for years: what to do with the 30 million tons of plastics that end up in US landfills annually. Researchers at Stanford University and China's Beihang University fed Styrofoam—long assumed to be non-biodegradable—to 100 mealworms. 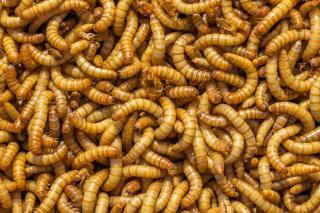 Not only did the mealworms stay healthy on an all-plastic diet, their excretions were biodegradable and appeared safe to use as manure, Science Alert reports. "The findings are revolutionary," researcher Wei-Min Wu tells CNN. "This is one of the biggest breakthroughs in environmental science in the past 10 years." While other insects have been known to eat plastics, this is the first time an animal has been observed biodegrading it. Please don't buy styrofoam or anything packaged in that nasty stuff. Wait a minute... The mealworms were only fed Styrofoam? But there are different kinds of plastics than that.